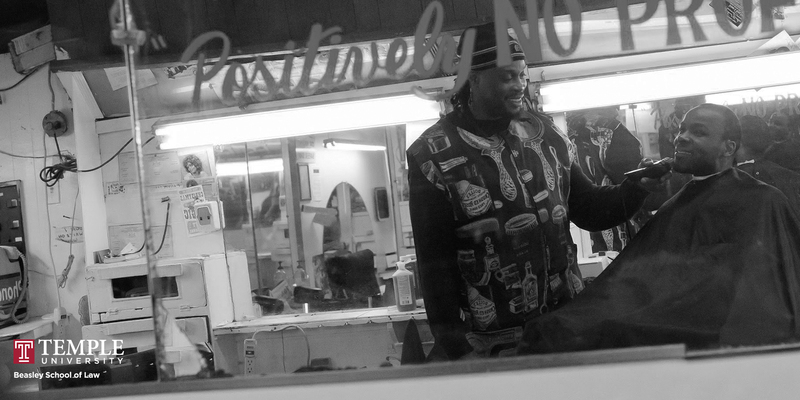 It’s a Thursday morning at Tommy’s Barbershop in North Philadelphia. It’s late morning, around 10:00 am, and the place is empty but for one gentleman eating what looks like either a late breakfast or early lunch. A few minutes later, Joel Michel, a Temple Law 3L, walks in. Instantly, the gentleman, who previously hadn’t even looked up from his boxed meal, lights up. 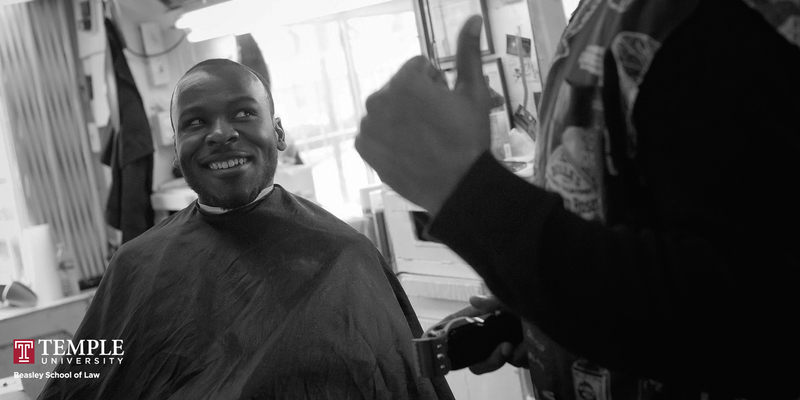 A handshake, a hug, and a few laughs later, Joel Michel is in the barber’s chair. He’s ready for his close up and a touch up. Joel Michel comes to this barbershop every two weeks or so. They give a good haircut, but it’s more than that. It’s an experience – both an investment in the community and a mini-course in trial advocacy. 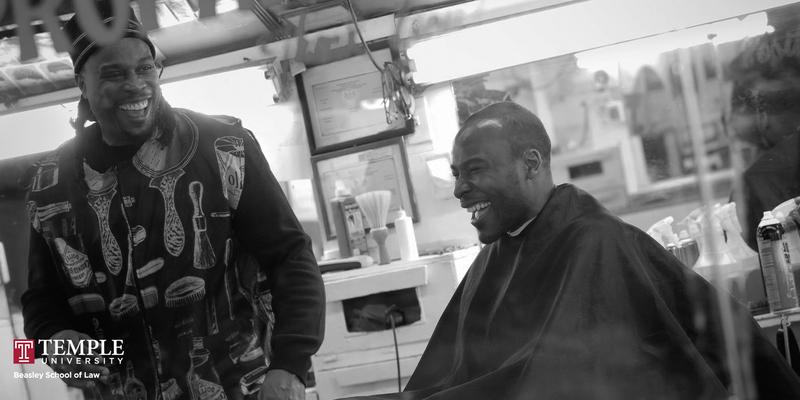 “The barbershop is rarely ever just about getting a haircut,” says Michel. He normally gets his haircut on Saturday, in a packed house filled with members of the community who love to talk and argue. The conversation ebbs and flows from sports to politics to women and raising kids, but there’s always disagreement. People in impoverished communities have strong opinions, Michel says, and the experience is akin to a trial ad course at Temple Law School. 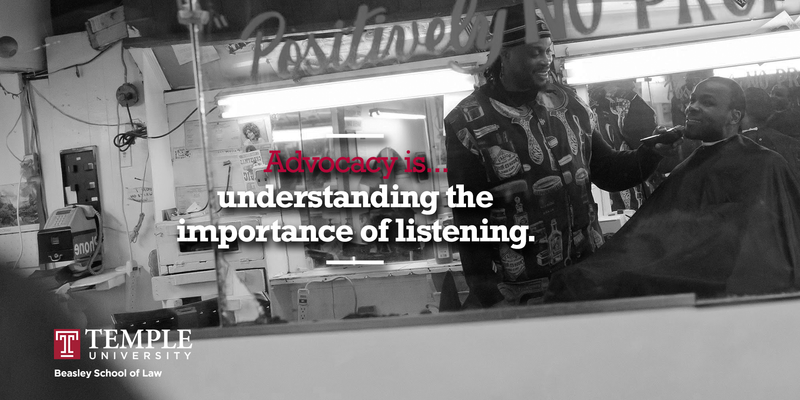 “In the barbershop, you need to be able to listen to what others are saying, but then also stand up and speak your opinion and have some reasoning behind you to convince your peers.” In the end, Michel says, friends in the barbershop will serve as a proxy for a jury, delivering their verdict via an affirmative or disagreeing head nod. If everyone who comes from these impoverished communities leaves when they make it, then those impoverished communities are always going to stay that way. There’s also the investment part of the bi-weekly appointments. The city of Philadelphia is earning national acclaim. It recently hosted Pope Francis and will host the Democratic National Convention in 2016. It’s also received tourism endorsements from outlets such as Travel + Leisure, The New York Times, and Huffington Post. The positive vibes are bringing more residents, including law students, to the city’s trendy neighborhoods like the Art Museum district, Old City, Northern Liberties, or South Philadelphia. Michel, however, chooses to live in North Philadelphia. By doing so, Michel can directly expose kids, and young African American kids in particular, to something better – to a new reality. That’s a very personal mission for Michel, who grew up in a rough area of West Philadelphia as one of 16 children. “I think early on I got exposed to the realities of an impoverished African-American community,” says Michel. That reality is a troubled track that includes drugs, guns, violence, and time served. If you talk with African American children in these communities, says Michel, they think that path is normal. What they lack is an exposure to something better. And so every two weeks, Michel spends $20 on a haircut and talks with members of the community, hoping to be the exposure that somebody, anybody, needs to put themselves on a new life track. “If everyone who comes from these impoverished communities leaves when they make it, then those impoverished communities are always going to stay that way,” he says. Michel arrived at Temple Law with no idea of what law school might be like and just one goal: earn a place on Temple’s nationally-ranked Trial Team and learn to try cases. Two years later, Michel is a star on the National Trial Team and is on track to join the prestigious law firm of Blank Rome LLP after graduation. He credits Temple Law students and faculty for helping expand his understanding of how he could affect change and do so at different scales. “My career doesn’t have to be my life’s work,” says Michel, who adds that too many people see their career as their only contribution to society. Everyone is living their lives like this is okay, but seeing that outside world, as it was for me at the time, helped me realize that this track was not supposed to be the norm. The barber finishes up with Michel’s haircut, and Michel, looking sharp in attire fit for a courtroom, gets ready to head home. He tells the story of the time he was heading to court, dressed in a suit and tie, when two young ladies behind him commented that there were “still some good brothers” in the neighborhood. “That made me think, ‘yeah, there are. There can be,’” says Michel. And with that, Michel begins his walk home, ready to prove to others that indeed, there is something better out there. Joel, I am so happy to read this story. I miss you and am thrilled to learn all of your hard work and talents are headed in the right way. Still playing the piano? Joel, Congratulations on your success. My name is Jacoby Vault, I am a young African American male freshman pursuing a sports management degree along with a Business Administration minor at West Virginia University. However, I plan to pursue my education at Temple Law School and make a change in the world. I was just writing you to congratulate you on your accomplishments and the change you’re making for you community.